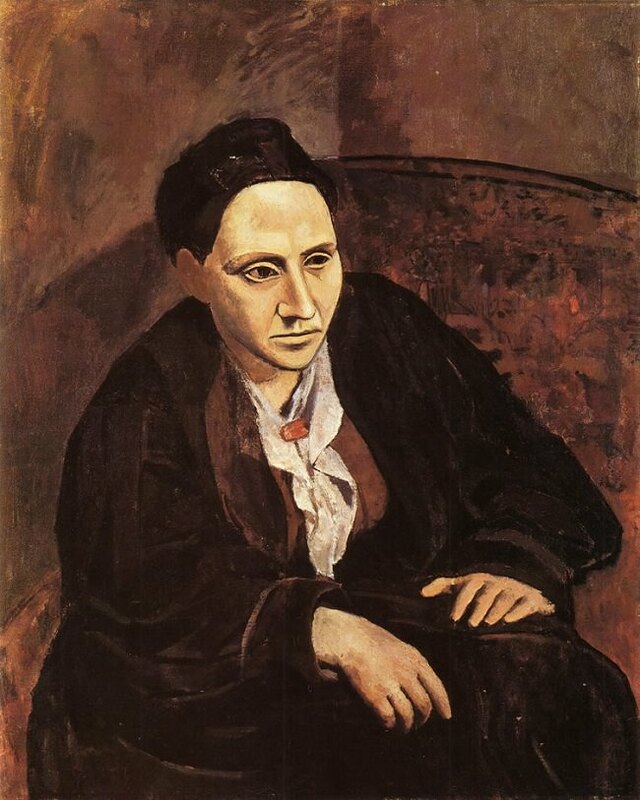 Gertrude Stein (1874-1946) was an American writer and art-collector who went to live in Paris and became a celebrated figure in the European modernist movement between 1910 and 1930. She was personally acquainted with artists Pablo Picasso and Georges Braque, and at her soirees she entertained writers such as Ernest Hemingway and F. Scott Fitzgerald. She wrote memoirs and novels, developed an avant-garde prose style, and had a famously lesbian relationship with her fellow expatriate Alice B. Toklas. She lived through two world wars, and had what is now seen as a very dubious attitude to the political events of her era. Stein was born in Allegheny, Pennsylvania, which is now part of Pittsburg. Her parents were upper middle class Jews with holdings in real estate. When she was three the family moved to live in Vienna, then to Paris, before returning to America. They settled in Oakland, San Francisco. She was a voracious reader as a young girl. Both parents died whilst she was a teenager, and she moved to live with her brothers and sisters in Baltimore. She attended Radcliffe College, which was then part of Harvard University. There she studied philosophy and psychology under William James, brother of the novelist Henry James. She conducted experiments in ‘automatic writing’ – which was later (incorrectly) compared to ‘stream of consciousness’ writing. William James encouraged her to enrol for medical studies so that she could develop her interest in psychology. At Johns Hopkins Medical School two things happened: she quickly became bored with medicine, and she had a sexual awakening with fellow student Mary Bookstaver. The affair was later fictionalised in her first novel Q.E.D. In 1903 she moved with her elder brother Leo to live in Paris near the Luxembourg Gardens on the Left Bank in an apartment with a studio attached. Leo had an introduction to the art dealer Vollard, through whom they encountered Cezanne, whose works they bought. This led to the acquisition of paintings by Gaugin and. Matisse, who became a personal friend. She started a cultural salon, which met on Saturday evenings. When Leo bought his first painting by the up-and-coming Pablo Picasso, they were introduced to the twenty-four year old Spaniard, who was commissioned to paint the now famous portrait of Gertrude, a work that he rated very highly. This immediately preceded his cubist period. Stein began writing in earnest, working on Three Lives which she regarded as her first book (having forgotten about the unpublished Q.E.D.). This was privately printed and considering the fact that she was an unknown writer it received good reviews, including one from H.G. Wells. The following summer in Fiesole near Florence she began work on The Making of Americans, a lengthy family history which was to become her major work. Alice Toklas arrived in Paris in 1907 as a fellow American Jewish ex-patriate. She quickly became Gertrude Stein’s companion, amanuensis, cook, lover, and ‘wife’. Their relationship lasted forty years. Meanwhile the art collection continued to expand at an extraordinary rate. It must be said that both Leo Stein and his sister Gertrude had an unerring eye for all that was new and of lasting quality in modern painting. Canvasses were stacked high on the walls of the studio in the Rue de Fleurus. Th artists who frequented her salon constitute a roll call of modernism – many of them visitors long before they became famous. Regulars included Picasso, Juan Gris, Robert Delaunay, Douanier Rousseau, plus writers such as Guillaume Apollinaire and Max Jacob. Stein and Toklas became particularly friendly with the composer Eric Satie. There was also contact with the world of English art. She was visited by Roger Fry, Clive Bell, Jacob Epstein, and Wyndham Lewis. But as the war approached Leo Stein decided to live in Florence. He and Gertrude divided the collection of paintings between them. The separation was not amicable, and it proved to have negative repercussions later – particularly for Alice Toklas. When the war broke out Stein was staying with Alfred North Whitehead in Cambridge. There she met Lytton Strachey and Bertrand Russell. As soon as they obtained the necessary papers she and Alice Toklas returned to Paris. After despatching copies of her manuscripts to America for safekeeping, they went to stay in Palma de Mallorca. Eventually they returned to Paris and joined the American Fund for French Wounded – Gertrude driving a car she had imported from America. They were sent to Perpignan and were later decorated for their services to the troops. After the war she met Sylvia Beach, the owner of the famous Parisian bookshop Shakespeare and Company. Through this connection she made friends with Man Ray and Ezra Pound. There were also social contacts with Ernest Hemingway, T.S. Eliot, the sculptor Lipschitz, Jean Cocteau, and Scott-Fitzgerald. She and Alice Toklas spent a long time in St Remy de Provence where she developed her ‘experimental’ style of writing. 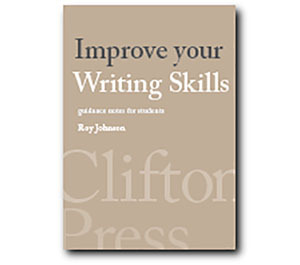 There was also some theorising about the nature of vocabulary, grammar, sentences, and paragraphs – much of which was eventually published in How to Write. She also had contact with musicians George Antheil and Virgil Thompson who became close friends. Stein provided the libretto for Thompson’s opera Four Saints. She was also introduced to the English poet and eccentric Edith Sitwell, a contact which led to speaking engagements in Oxford and Cambridge. Her avant-garde work was published in various literary magazines, including the short-lived transition, which also presented the work of Samuel Beckett and James Joyce. Then the ever-faithful Alice Toklas published her work in a privately-printed series called Plain Edition. Meanwhile, her reputation was being promoted by her friend Mabel Dodge Luhan, a wealthy patron of the arts. In 1934 she returned to America after a thirty year absence for a lecture tour which was well publicised and resulted in a publishing contract with Random House. She settled in the south of France and befriended the French historian Bernard Fay, who was to have an important part to play in her later years. Politically she was radical in a manner few would have expected. She believed that Adolf Hitler deserved the Nobel Peace Prize, and she supported General Franco during the Spanish Civil War. Then, at a time when many radicals and persecuted minorities were fleeing the onset of Nazi Germany, she stayed stubbornly in Paris. Even when the second world war began, she simply sealed up her priceless art collection, and it remained untouched until her death. She too remained untouched, whilst Vichy France deported 75,000 other Jews to the concentration camps – only three percent of whom survived. It is thought that she was being protected by the influence of Bernard Fay, who was a collaborator with the Nazis. But Stein was herself also an active collaborator, a supporter of Marshal Petain, the head of Vichy France. She even translated some of his speeches, which she found ‘really wonderful … so extraordinary’. In 1944 whilst she was living in southern France, the entire population of Jewish children from her town were deported to Auschwitz. And she remained a supporter of Petain even after the war when he was being sentenced to death as a collaborator. Her friend Bernard Fay received a similar sentence, but he managed to escape to Switzerland, with money supplied by Alice Toklas. In 1946 Stein died of stomach cancer at the age of seventy-two and was buried at Pere Lachaise cemetary in Paris. She willed much of her estate to Alice Toklas, including the art collection, which had by then increased enormously in value. However, their relationship as two lesbians had no legal status at that time. The Stein family removed the paintings from Toklas’s residence during her absence and locked them in a vault. Toklas died in poverty at the age of eighty-nine and was buried next to Gertrude Stein in Pere Lachaise. Gertrude Stein famously gave an account of her own life by writing The Autobiography of Alice B. Toklas (1933). This is largely an account of their years together in Paris – but told as if from the point of view of her companion, amanuensis, and lover, Alice Toklas. It is a curious book in that it relates the events of their partnership in a faux-naif manner, as if a child were trying to string together fragments of experience, and failing completely to give them chronological order or any sort of rational coherence. Sentences not only words but sentences and always sentences have been Gertrude Stein’s life long passion. And so she had then and indeed it lasted pretty well to the war, which broke down so many habits, she had then the habit of beginning her work at eleven o’clock at night and working until the dawn. She said she always tried to stop before the dawn was too clear and the birds were too lively because it is a disagreeable sensation to go to bed then. There were birds in many trees behind high walls in those days, now there are fewer. The literary ‘style’ is characterised by incessant repetition, non-sequiturs, and fractured syntax. And Stein does not shrink from writing flattering assessments of her own ‘genius’, disingenuously putting the words of praise into someone else’s mouth. She [Stein] had come to like posing, the long still hours followed by a long dark walk intensified the concentration with which she was creating her sentences. The sentences of which Marcel Brion, the french critic has written, by exactitude, austerity, absence of variety in light and shade, by refusal of the use of the subconscious Gertrude Stein achieves a symmetry which has a close analogy to the symmetry of the musical fugue of Bach. One of the men was so moved that he confided to me as we went out that the lecture had been his greatest experience since he had read Kant’s Critique of Pure Reason. We happened to go to a show of pictures at the Galerie Bonjean. There we met one of the russian brothers, Genia Berman, and Gertrude Stein was not uninterested in his pictures. She went with him to his studio and looked at everything he had ever painted. He seemed to have a purer intelligence than the other two painters who certainly had not created the modern movement, perhaps the idea had been originally his. She asked him telling her story as she was fond of telling it at that time to anyone who would listen, had he originated the idea. He said with an intelligent inner smile that he thought he had. She was not at all sure that he was not right. He came down to Bilignin to see us and she slowly concluded that though he was a very good painter he was too bad a painter to have been the creator of an idea. Just in case this might seem like selective quotation or biased, special pleading, here is the opening of one of her short stories from the collection Tender Buttons. The story is entitled Rooms. A whole centre and a border make hanging a way of dressing. This which is not why there is a voice is the remains of an offering. There was no rental. So the tune which is there has a little piece to play, and the exercise is all there is of a fast. The tender and true that makes no width to hew is the time that there is question to adopt. Gertrude Stein was a celebrated figure in her own circle of fashionable wealthy American expatriates, but it is not altogether surprising that her literary output now remains largely forgotten.